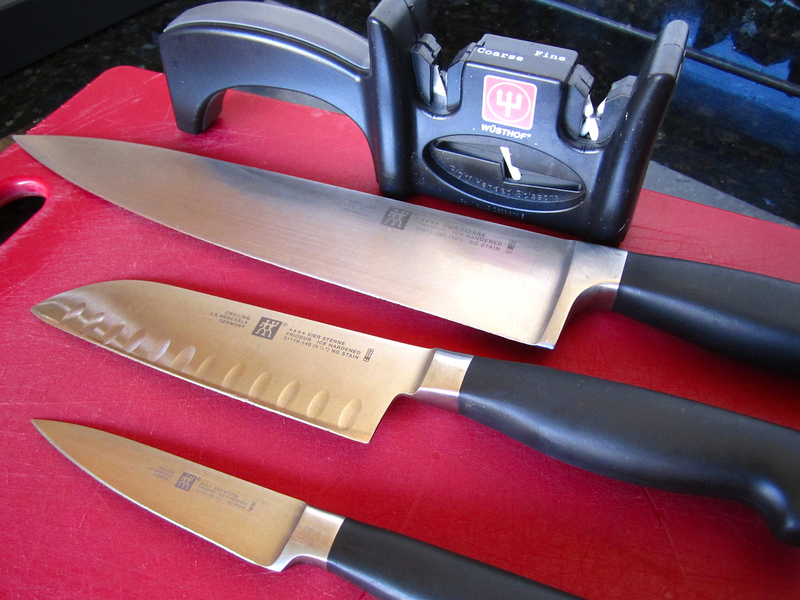 Knives are an essential kitchen "ingredient" and there is a lot of debate about what kinds of knives you should have. I am a little bit of a kitchen purist in terms of tools so I like to have at least a good selection for different purposes but I also only end up using 3 of them on a regular basis. In the end, you should use knives that you're comfortable with. Jen refuses to use the chef's knife because it is heavy, large and very sharp, but I lovingly taunt her for using a paring knife when it's not the right tool (like cutting chickens up)...but if she's comfortable then that's the tool she should use (just might take longer). Additionally, I keep 5 other knives, including a cleaver (for the big meat cutting), a large Santoku (multi-purpose), and a filet knife (for meats). The quality of the steel and the weight are the two most important factors. I really like some of hte porcelain knives but while they stay sharper longer, they are more difficult to sharpen. These are all Henckel Four Star which is on the upper end but still affordable, well balanced, good steel and excellent grips. Don't put them in the dishwasher - always hand wash your knives. A chef's knife is a large knife - generally about 8" to 12" - and made of good carbon steel or porcelain (I love the porcelain but I still tend to stick with the steel). If you're going to invest in any kitchen tool, this is the one to not chintz on. I use a 10" Henckel Professional. It's heavy but it has a slip-resistant grip that fits my hand well, and the blade is curved just right for all types of cutting, including rocking (following the curve from tip to handle back and forth to cut). Make sure the blade is strong (should not flex at all) and it should be very sharp (sharpen it about once a week). A kitchen paring knife is a small knife - about 3" to 4" - and serves a wide range of purposes. The funny thing about paring knives is that they are meant for both peeling and slicing, and consequently it's actually a good idea to have 2. Peeling requires a slightly dull knife because it provides control when slipping between the skin and flesh. Slicing and shaping (detail cutting) requires a sharp blade. So here I actually recommend having a good one for slicing and a nearly disposable one for peeling. A Santoku is a general purpose knife of Japanese origin, marked by a medium blade - 6" to 10" in length - with one relatively flat, sheepsfoot blade and a curved top. The popular Westernized design has scallops just above the blade, but the metal is uniformly thick the entire distance. 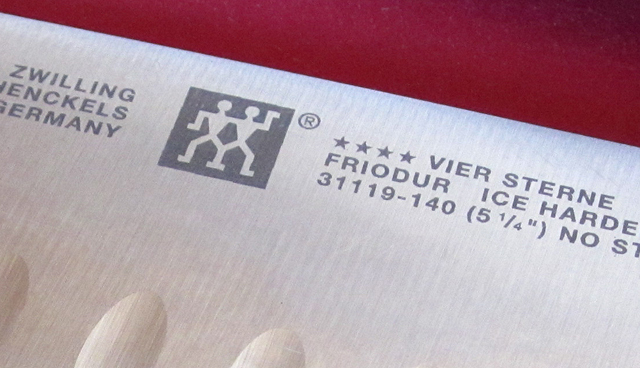 Cutting is done in a single, straight-down motion instead of sliding as one would with a chef knife. Blades typically stay sharp longer. I have 2 of these - the smaller Henckel in the photo that I use a lot, and a thicker Wusthof that is good for small cleaving. Whatever you choose for knives, keep them cleaned well, lightly oiled when not in use (will help preserve the steel), and properly sharpened. I have been looking for a knife sharpener... do you have any affordable suggestions?? The one in the photo - a Wusthof hand sharpener - is only about $15 on Amazon. In my opinion, nothing beats a double sided carbide block with a bit of oil (which you can get in some stores, like Home Depot, for under $10), but you need to get the angle of the blade right and it takes a bit of practice.